The game is jam-packed with pieces sure to please any gamer. Along with the four , the game also includes 90 stackable plastic tiles for building skyscrapers, four individual monster playmats, 86 terrain and power tokens, and much more. 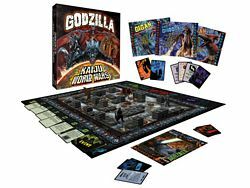 You’ve never had so much fun ravaging the world as you will when you play GODZILLA: KAIJU WORLD WARS!